Phone : (212) 256 21 21. Operates an FM radio station radio 2019 at 90.6 MHz Young crowd, lively atmosphere, good music and friendly staff. 5.KAT (FIFTH FLOOR) (B C R gl M !) 18-02h Siraselviler cad. Soganci sok. No:7, Taksim. Phone:(212) 293 37 74 (Close to German Hospital, ask for BILSAK) View of Bosphorus. Chic, stylish and good food. BARBAHCE (FIRST FLOOR) (B GL M) (The same building with 5.KAT) Lively atmosphere, trendy place and busy at weekends. PRIVE (B D G) 24-04h Tarlabasi Bulvari 28,Taksim. Phone : (212) 235 79 99 Alternative to Club 14, less trendy but very cruisy. HAN CAFE (B G F MA) 09-02h Cumhuriyet cad. Taksim Square. Evenings and nights. Very cruisy. Back bar has a lesbian barmaid. KEMANCI / MANDALA (B NG YP !) Siraselviler cad.69, Taksim. Phone : (212) 245 30 48 Three floors each with its own bars and live rock music. Top floor more gay. 1001 MARLYN (AYOR TV R B D S) 24-04h Siraselviler cad. Risk of being overcharged. VAT 69 I/II (AYOR B D TV R S WE) Istiklal cad. Imam Adnan Sok. 7,Taksim. Risk of being overcharged. CAFÉ GRAMOFON (Tünel Meyd. 3, PHONE: 212/293-0786), a café during the day, becomes a jazz bar evenings Tuesday-Saturday. It's at the opposite end of Istiklal Caddesi from Taksim Square. HAYAL KAHVESI (Büyükparmakkapi Sok. 19, Beyoglu, PHONE: 212/224-2558) attracts a mostly young crowd for live (and loud) rock and blues. HARRY'S JAZZ BAR (Hyatt Regency Hotel, Takisla, Taksim, PHONE: 212/225-7000) sometimes hosts live blues and rock acts. JAMES JOYCE (Zambak Sokak 6, Istiklal Cad., Beyoglu, PHONE: 212/244-0241) has live music every night and Irish music on weekends. KEHRIBAR (Divan Hotel, Cumhuriyet Cad. 2, PHONE: 212/231-4100) is a good place to sample the latest in Turkish music - it has live pop and jazz. Catwalks features fusion foods and has a great sea view out the window. The restaurant opens at 19.00 and closes when the last customer leave. 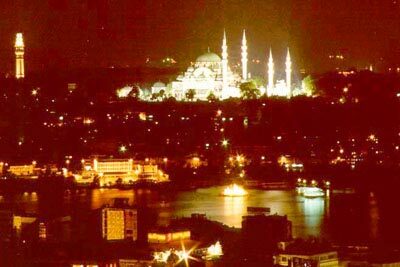 Located in the historical “Sepetciler Kasri”, Hammam’s restaurant transforms into a nightclub at night. Th party goes until 02.00 - 03.00. Lacivert is one of the Istanbul’s ten newest restaurants. The venue is an Istanbul mansion. Joy is a restaurant, bar and nightclub ans is open from 19.00 – 04.00. You can listen to trip pop, acid jazz and Latin Music. It is essential to make a reservation for dinner. A nightclub where you can hear underground music. As a supper club, Soho serves Italian and French cuisine. No live music, but a different DJ provides the tunes every night. Attracts a mostly young crowd for live (and loud) rock and blues. Sometimes hosts live blues and rock acts. Three floors each with its own bars and live rock music. Top floor more gay. The same building with 5.floor) Lively atmosphere, trendy place and busy at weekends. Siraselviler cad. Arslanyatagi sok. 9, Taksim. Telephone: (212) 256 21 21. Operates an FM radio station radio 2019 at 90.6 MHz Young crowd, lively atmosphere, good music and friendly staff. 24-04h.